I know of only one. It was made public by TD awhile back at the Cut Off road show event and once again the "Let's Talk FB" event on the WB. $36 million Athletic Academic Performance Center. Unless it's something else then I wouldn't know. when this multi level complex is built, will the football field, because it is located above ground level, be expanded to a full 100 yards ? I doubt it because it's on the exact footprint as the current practice field itself. Just not 120 yards available in that location. Absolutely a more appropriate use of $$$, and a second deck and other expansion in end zones also feasible. Right on golfnut. Ok Kaare. So Dannen is wrong? Kaare is the one that said Tulane was building a Dome stadium on campus instead of Yulman. No it's not more appropriate to spend another dime on Yulman at this time. Plus it will be a 3rd deck on one side anyway which will look even more ridiculous. Dannen knows what we need now support him. With the possibility of Tulane dropping football if fortunes don't turn, do we really think major money is going to be spent on any more football related facilities. Have to expect whatever is built can be used for other purposes. I have to agree. Unless and until we can demonstrate we have finally built a consistent,winning football program, why blow more money on Yulman! I really don't understand how you think this inflatable roof will work? It's pressurized. Still wish they would demo Wilson, rebuild it, and use the entire footprint to build the practice field on top of. You would easily have 100+ yards. 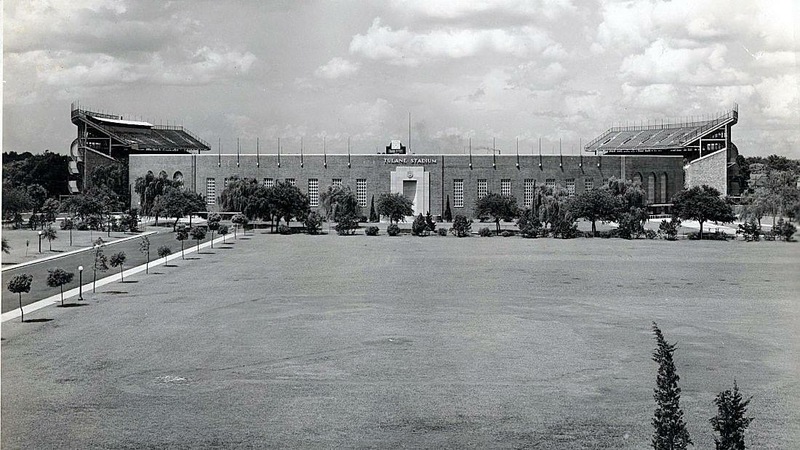 NOLABigSteve wrote: Still wish they would demo Wilson, rebuild it, and use the entire footprint to build the practice field on top of. You would easily have 100+ yards. Pythagorean theorem. Build the building diagonally, and you will get a real practice field. You can incorporate Wilson into this but what are you going to do with Turchin? 100 yard diagonal probably literally ends in Tulane's baseball dugout. Am I missing something? No doubt this diagonal design as noted above could have worked for Yulman. They never should have built non athletic facilities between Willow and Claiborne. This part of campus was designated the athletic side of campus. Once the stadium was torn down the University did a land grab on athletic land. So sad. The Reily Center and field, TISM, Diebold lot, Dorms and that Coffee shop area all stole our land for athletic facilities. Tulane missed on a once in a lifetime opportunity to buy properties on Calhoun St right after Katrina to expand our footprint. Property values were 1/5 of what they are now. Not at all. The hypotenuse of a right triangle is solved with the equation above. The rectangle that makes up the current field, when cut in half diagonally makes two right triangles. C=the shared hypotenuse of those two right triangles. Thus, building the complex diagonally will give you the space you need for a football field. it would not stretch beyond the current footprint. This is nothing fancy. it is just basic geometry. About the practice field as it exists today is it a total of 80 yards or are there end zones? I will show you how much space you would have if you built the new facility diagonally. Also, does it have the proper width for a football field? I believe it was 70 yards and one end zone for a total of 80 yards. That was before they lost 30 yards of that when they had to take the west end of it for space to bring the TV crews trucks and such back there. I do believe the width was there but just barely as the north sideline abutted the fence separating it form the baseball stadium which is why it was never used to actually practice on. winwave wrote: I believe it was 70 yards and one end zone for a total of 80 yards. That was before they lost 30 yards of that when they had to take the west end of it for space to bring the TV crews trucks and such back there. I do believe the width was there but just barely as the north sideline abutted the fence separating it form the baseball stadium which is why it was never used to actually practice on. Ok, so moving the field diagonally will get you 96 yards. If you can somehow reclaim the thirty yards by accommodating the media differently then you can get 122 yards by going diagonally. Wait, I am sorry, I misread what you wrote here. Is the field now 50 yards? Yes it is now 50 b/c of the loss of space. Since the field will be on top they should be able to get that space back. I don't understand what u r talking about. The area is an enclosed rectangle. Moving the field diagonally can add length but sacrafice width. I don't think u have ur geometry correct.